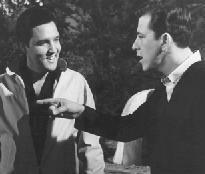 #19 - Acting with Elvis Was "A Wonderful Life" for Jimmy Hawkins (Part 1) • Where Hollywood Hides... the home of classic TV, movies, music, & celebrities! Listen to Jimmy Hawkins NOW! When it comes to the world of acting in Hollywood, nobody else comes close to Jimmy Hawkins’ history of nearly 200 acting roles working alongside stars like Shelly Fabares, Elvis Presley , Rick Nelson, Fred McMurray, Brandon DeWilde, Sally Field, Spencer Tracy, and Katharine Hepburn. This interview (the first of 2 parts, each offered at 50% discount) is an informal conversation over lunch (you’ll hear lots of eating and drinking!) as Jimmy recalls intimate details of a long career that began when he played “Tommy Bailey” in Frank Capra’s It’s a Wonderful Life opposite James Stewart and Donna Reed. 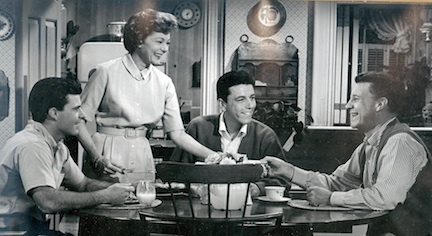 Jimmy Hawkins’ life as a Hollywood actor known as “America’s favorite boyfriend and sidekick” took him on a long string of hit TV shows that included Leave It to Beaver, Ichabod & Me, Petticoat Junction, Gidget, The Donna Reed Show, My Three Sons, and The Adventures of Ozzie & Harriet. In describing his unique career path, Jimmy shares inside stories of casting calls at MGM and Paramount Studios, and describes the chain of events that eventually led him to co-starring alongside Elvis Presley in some of the rock star’s best movies, including Spinout and Girl Happy.